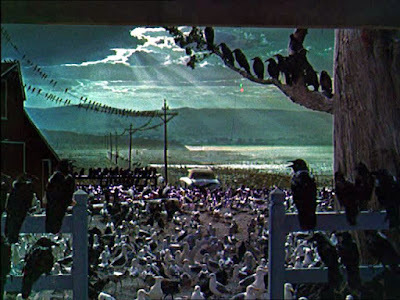 The Birds (1963), coming relatively late in Alfred Hitchcock’s illustrious career, was one of his biggest and most memorable hits. It was the fourth film in a string of expressionistic classics, following Vertigo (1958), North by Northwest (1959), and Psycho (1960), that mark a sustained period of high artistic achievement. Although critics dismissed him as a mere crowd-pleasing showman, Hitchcock’s novel narrative structures in each of those four films were keys to their successes with viewers. 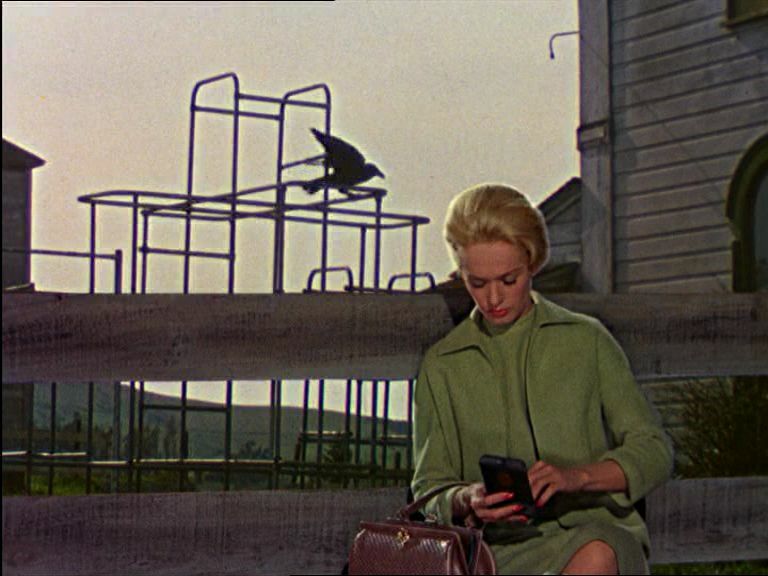 In particular, The Birds features a curious two-part narrative structure somewhat like Vertigo and Psycho. Both of those preceding films initially drew negative reviews from the critics because of the way they each presented two almost separate stories back-to-back. 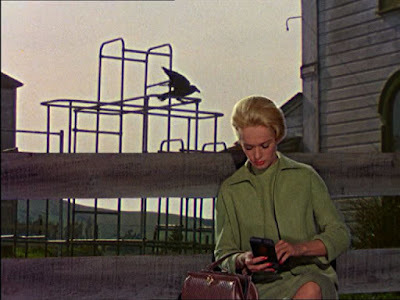 The Birds also features two separate narrative threads, shifting from the first over to the second as the film progresses. 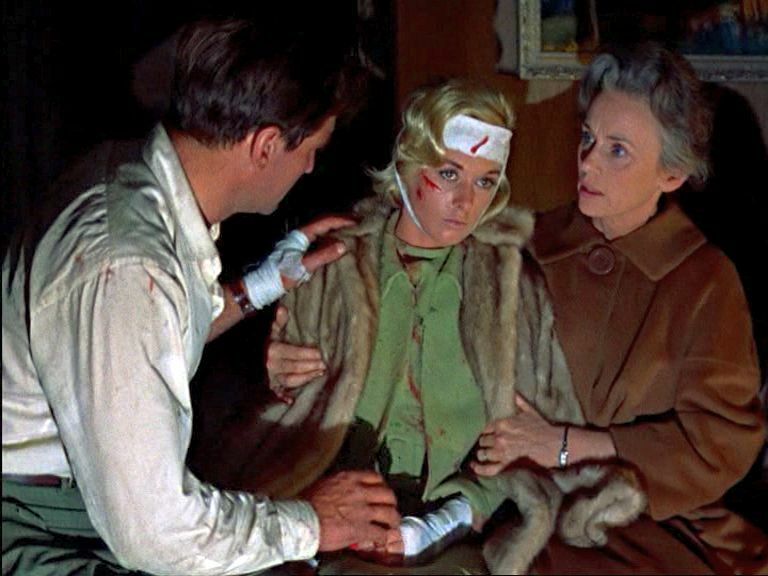 But while the separate stories in Vertigo and Psycho were at least linked by a murder, the linkage between the two narratives in The Birds is obscure and has confounded (and intrigued) critics and viewers alike. To some people there is no significantly meaningful connection between the two narrative threads, while others have proposed a variety of suggestive implicative links. 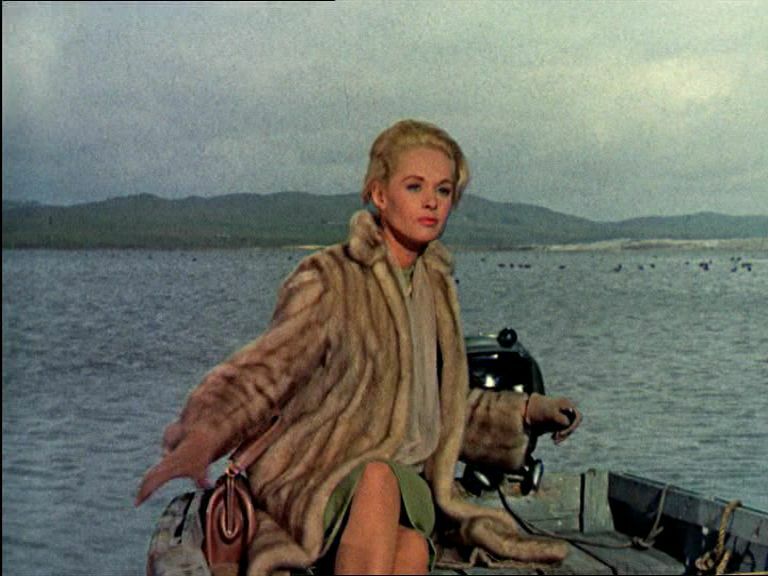 Whatever the case, The Birds, like its two double-narrative predecessors, was also initially panned by the critics. Nevertheless, it stands today as one of the all-time great films . Hitchcock and his screenwriter, Evan Hunter (aka “Ed McBain”), added more, including material for that first narrative, the relationship thread. This enabled them to highlight the almost iconic Hitchcockian narrative elements of (a) a classy beautiful blonde heroine and (b) a mature male lead closely hovered over by his fussy mother. Usually Hitchcock used big-name stars in these principal roles, but he eschewed that practice this time and daringly cast in the big roles some lesser-known figures, who turned out to fit Hitchcock’s expressionistic intuitions to a T and from whom he got very good performances. Naturally, many films have a relationship thread, and it is usually a secondary feature to the main problem-to-be-solved thread, such as in Hitchcock’s The 39 Steps (1935). Sometimes the relationship thread can be elevated to have a delicious involvement in the problem thread, as in Notorious (1946), and of course sometimes the whole film can simply be about a key relationship, such as in a romantic comedy. However, if the relationship thread is elevated to high prominence and equal status with the problem thread, the viewer expects some significant connections between the two. 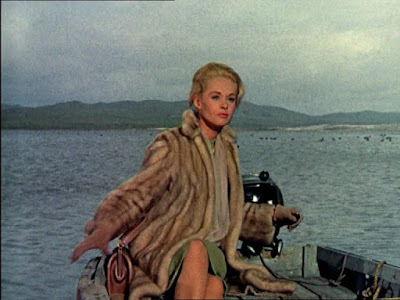 And this quizzical narrative connection is what critics struggle with when watching The Birds. The story proceeds through four main phases and begins with the first narrative thread, which has all the appearances of a light romantic comedy. The film opens in San Francisco, with a beautiful and fashionable blonde, Melanie Daniels (played by Tippi Hedren, an unknown in her film debut) entering a bird shop in order to purchase a provocative gift (a mynah bird) for a relative. She is clearly chic, cordially self-confident, and accustomed to deferential treatment. She also likes to spoof people in her elegant way, so when an equally self-confident young man, Mitch Brenner (Rod Taylor), enter the shop looking to buy a pair of lovebirds, she immediately begins sparring with him. On this occasion she uncharacteristically loses the encounter and is intrigued by the man. After he leaves the shop without the lovebirds, she tracks his residence down to Bodega Bay, a fishing village two hours north of San Francisco, and she decides to play another prank by buying the lovebirds and delivering them, along with a sarcastic note, to him. All this puts us in the groove for a romantic comedy. The next day she drives up to Bodega Bay in her fancy sports car and then hires a boat to make a sneak delivery of the lovebirds into the bay-facing back entry of Mitch's house. But her delivery of the lovebirds is marred when a seagull swoops down on her while she is in the boat and gives her a minor head injury. Seeing what happened, Mitch takes her to his home and introduces her to his mother, Lydia (Jessica Tandy), who lives with him. After some more sparring between Mitch and Melanie, he invites her to stay for dinner, and given the long drive back to the city plus an invitation to attend a birthday party the following afternoon for Mitch’s 11-year-old sister, she decides to stay for the night at the home of a local schoolteacher, Annie Hathaway (Suzanne Pleshette), whom she had met earlier when entering Bodega Bay. All the while Melanie is struggling not to show too much interest in the handsome Mitch, and he is showing equal prideful reserve. The next day at Cathy’s outdoor birthday party, Melanie and Mitch take a stroll and get to know each other better as they let their guards down. But the party is interrupted by a mysterious and violent bird attack. 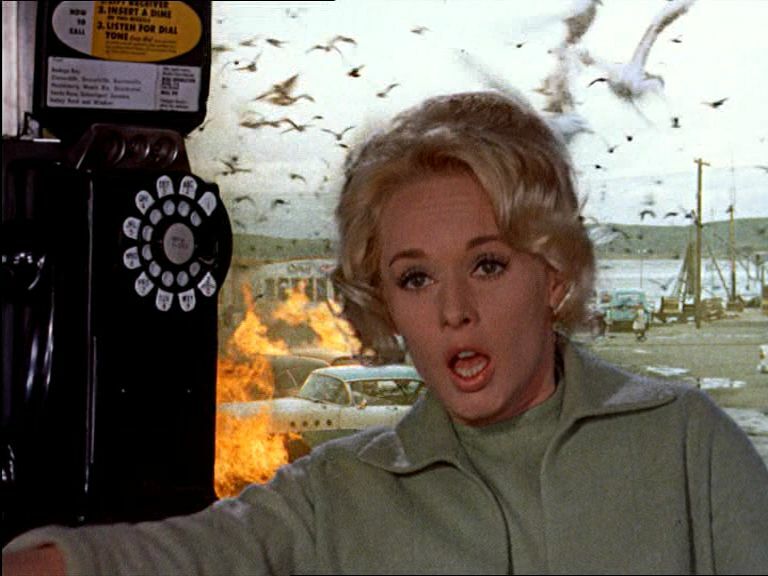 Now, fifty minutes into the film, this is when the bird issue comes to the fore and takes over the film. Later that night at the Brenner’s residence, a different group of birds – sparrows this time instead of seagulls – comes down through the chimney and attacks the family. Mitch manages to shoo the birds out, and Melanie decides to stay over with them for the night. The next morning Lydia drives over to a neighboring chicken farm and is alarmed to discover the dead body of the farmer, with its eyes having been gouged out by birds. Meanwhile Melanie and Mitch have been getting on together and their ardent morning kiss suggests they may have consummated their relationship the previous night. When Lydia comes home and reports what happened at the neighboring farm, she is in a state of shock, and Melanie promises to go to Cathy’s school and see that she gets home alright. It is at this point that we move into the realm of horror. In one of the all-time great buildup scenes, Melanie waits on a bench outside the schoolhouse while the children are singing a nursery rhyme. 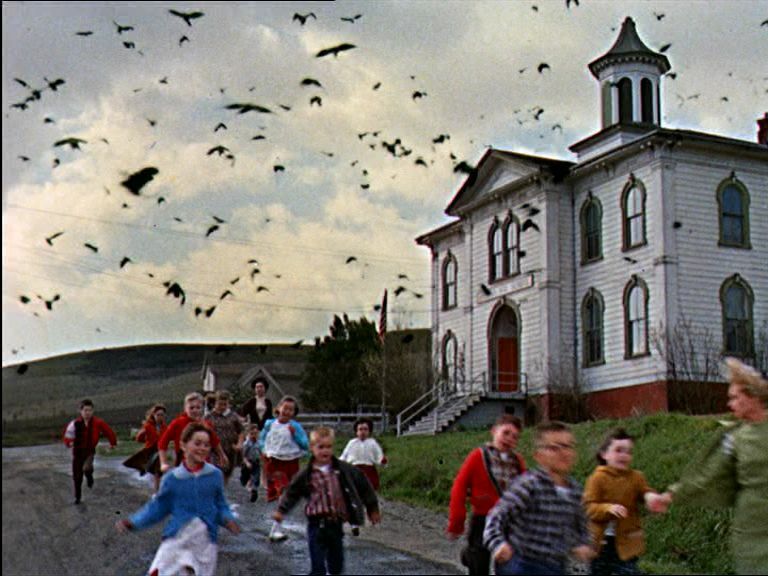 As the singsong lyrics are repeated by the children, we see birds gradually gathering behind Melanie’s back outside the school. When she turns around, she is alarmed to see a massive armada of crows crowded onto the school’s jungle gym. She informs Annie inside, and the children are ushered out, but the birds attack them viciously. 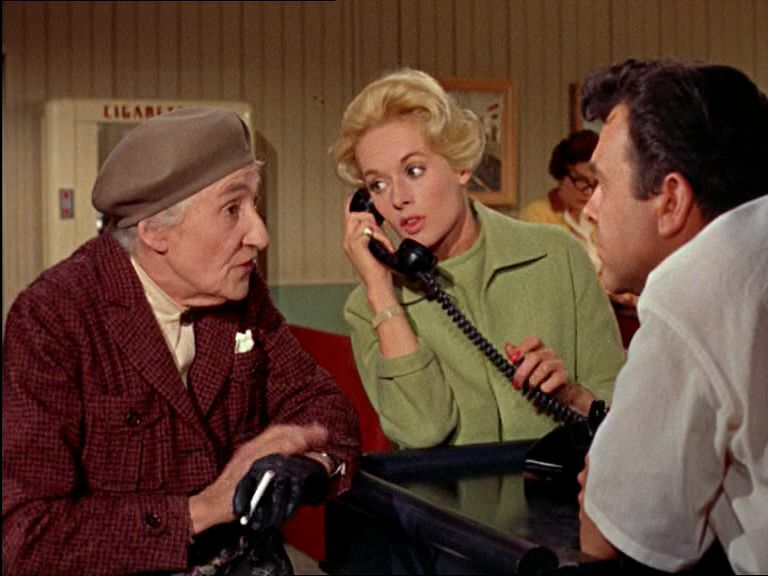 After the attack, Melanie makes it to a local diner in town, where the customers engage in an animated discussion about what is happening with the birds. An amateur ornithologist looks for a scientific explanation, a salesman says birds are a nuisance and should be exterminated, and a drunkard sees it all in apocalyptic terms. Then a scared mother of two children points at Melanie and says all this trouble began the moment the elegant outsider arrived in town, so she must be a bearer of evil. After another bird attack, during which Mitch arrives, the two of them go back to the schoolhouse to fetch Cathy. They do find Cathy, but discover that Annie was slaughtered by the birds in the earlier attack. Back at his home, Mitch begins boarding up all the windows to protect the family from the next attack. They have become aware that the birds seem to attack after regular intervals, and in the meantime they settle down and perch silently. The next bird attack is another highlight of the film, with an outstanding sequence of dynamic camera angles and tight editing. Again the family survives, but just barely. During the following lull, Melanie hears an upstairs rustling while the others are asleep downstairs and goes up into Cathy’s empty bedroom to investigate. Upon entering the room, she sees that birds have torn a hole through the roof and accumulated there inside the room. They attack her immediately, almost killing her. Mitch just manages to save her, but Melanie is now severely injured and in a state of shock. With his house now compromised with holes and the birds momentarily in one of their lull periods but gathering in massive force for their next assault, Mitch knows time is running out. There is little chance that he and his three women can survive the next devastating attack. Hitchcock’s expressionistic mise-en-scene is in its full glory in The Birds and helps make this one of the great films. I have already mentioned two outstanding sequences – the buildup to the bird attack on Annie’s school and the attack on the Brenner home in Act 4 – but there are many other well-crafted scenes throughout. 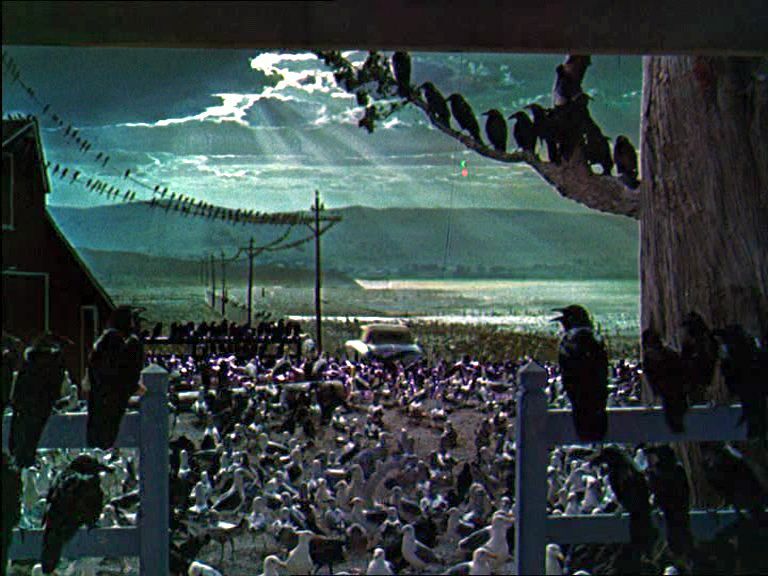 In general, the special effects used in connection with presenting the attacking birds are still effective even today and are amazing to see. And the bright technicolor hues, which can sometimes appear unrealistic in other contexts, work well to enhance the expressionistic feel of the presentation. 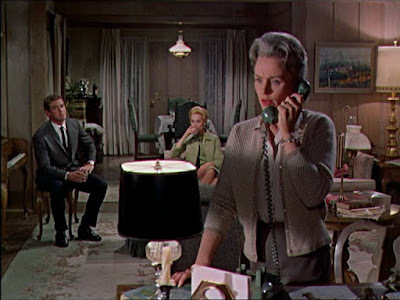 Credit must be also given in these respects to cinematographer Robert Burks, (a regular with Hitchcock since Strangers on a Train), and film editor George Tomasini (Hitchcock’s regular editor since Rear Window). The acting is also generally good and expressionistically appropriate, with Hitchcock’s many closeups of Tippi Hedren highlighting her ethereal beauty. There is one scene, however, that is seriously out of whack with the rest of the show, and that is the discussion about the birds with the townspeople in the local diner. The acting in that scene is seriously overdone and artificial, lowering the film into B-grade histrionics. Curiously it is this scene that the screenwriter claims was his great achievement in the film . The question of what was behind the bird attacks is still an issue though. There are several possibilities. 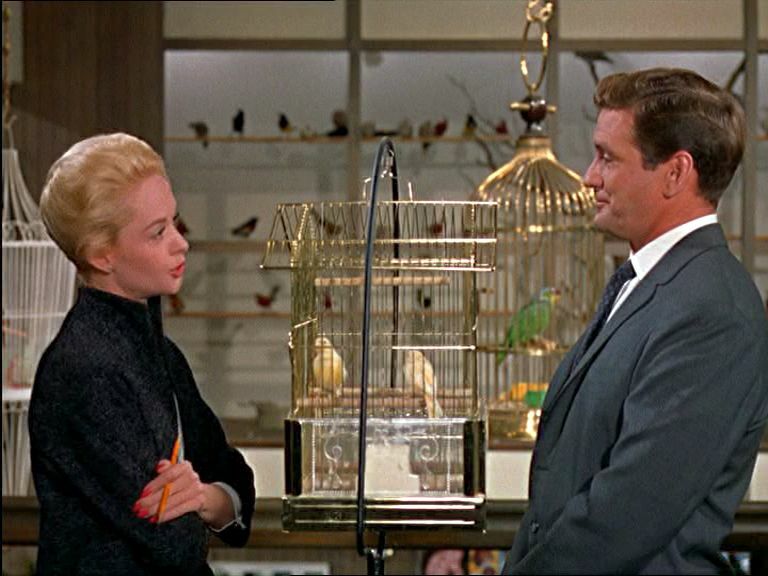 The lovebirds (Hitchcock's "MacGuffin" in this film ) that Melanie brought to Mitch Brenner are quiet and utterly docile. But they seem to have symbolic significance, and their appearance more or less coincides with the bird attacks. Perhaps the lovebirds trigger an eruption of the bird world’s fury over the way mankind has trapped, killed, and confined innocent birds. In the last scene when Mitch is ushering Melanie and his family into Melanie’s car for an attempted escape, Cathy says she wants to take the lovebirds along with them. In these dire circumstances, you can almost hear the viewers imploring Cathy not to do that – that those lovebirds are somehow linked to the bird kingdom’s unquenchable rage. Melanie is beautiful, but she is artificially coiffed and clad in mink. Both she and Mitch are used to manipulating the world – almost playing with it – to get what they want out of it. As such, they are uncooperative extractors, not inclusive contributors, to the world’s life force. Perhaps, then, Melanie is an iconic representative of man’s separation form the natural world, which has induced its wrath. According to this interpretation, the hysterical mother was more or less correct when she denounced Melanie for bringing on the birds’ rampant attacks. 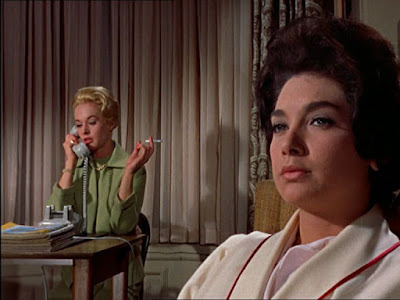 “[Hitchcock was] in the main line of the Hollywood view of the divinity and yet ultimately secret malice of woman. . . . So from this perspective, the rage of the birds (and hence nature’s rage) may be somehow associated with the mystery of feminine power. Going further and more fundamentally, we can observe that there is something ultimately mysterious about what it is that activates the universe. What is the source of this unfathomable animation that drives our consciousness and our experiences? This is an issue that was touched on in Tarkovsky’s Stalker (1979), wherein “the Zone” was a region representing the dynamic vitality of existence, which could be both a promise and a menace but was ultimately unknowable. Philosopher Galen Strawson has commented lucidly on this topic, for it is an unresolved philosophical issue . In this sense the eruption of the bird kingdom’s rage is essentially a manifestation of nature’s ultimate, savage unpredictability. But it is not mechanical unpredictability, like an explosion or a hurricane; it involves the unpredictability of primordial agency. We must admit that we have no intellectual grasp of primordial agency. It can embody love or hatred without our understanding. In my view it is this last scheme that captures what it is that makes The Birds so endlessly fascinating. The film thus represents the ultimate in existential horror. It is not just that we might be destroyed, but that nature itself, the primordial prana or qi, might erupt in uncontrollable predatory hatred and annihilate us, humanity. 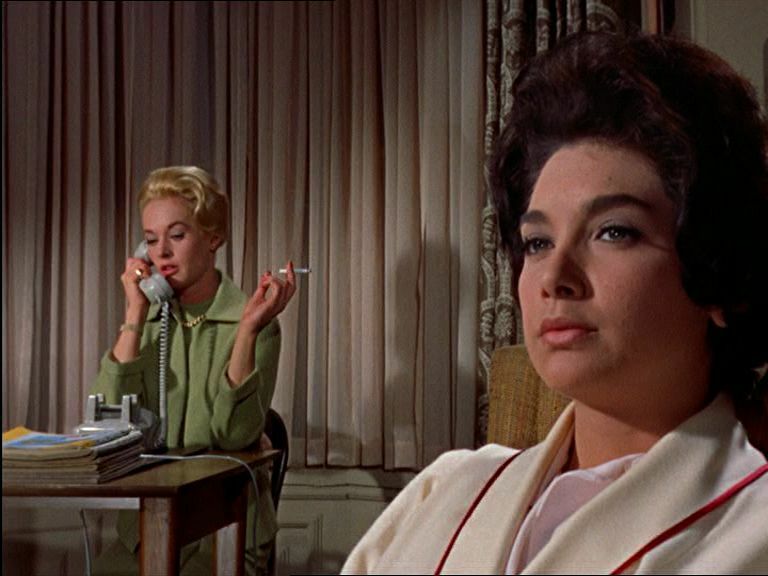 Hitchcock needed the relationship narrative to situate the viewer’s empathy across a range of human caring and feeling among the main characters, so that it could be contrasted with impenetrable, nihilistic hatred. This is not just about lovebirds, or femininity, or a response to human selfishness. It is about something deeper and more dreadful. It was Hitchcock’s art to be able to capture this consummate horror in film form. Roderick Heath, “The Birds (1963)”, Ferdy on Films, (2006). Christopher Mulrooney, “The Language of The Birds”, Deep South, University of Otago, New Zealand (2007). "MacGuffin", Wikipedia, (22 June 2016). The Film Sufi, "Alfred Hitchcock", The Film Sufi (23 May 2009). Camlle Paglia, The Birds, The British Film Institute, (1998). Michael Sragow, “The Savage id”, Salon, (13 Aug 13 1999). Galen Strawson, “Consciousness Isn’t a Mystery. It’s Matter”, The Stone, International New York Times, (16 May 2016).